Who else here is a fan of tassels? Whether they’re made of tissue paper, cotton, yarn, or leather – we’ve fallen head-over-heels in love with the humble crafty creation! 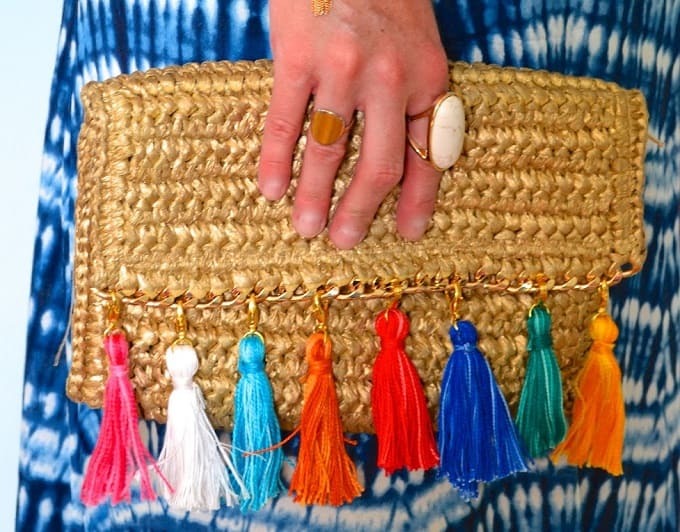 Tassels have risen in popularity lately (they’re everywhere) and for good reason too. They can adorn everything from jewelry and shoes to cushions, blankets, bags, and cakes…just to name a few! You’ll find all of these projects and more in our super-sized round-up of the best 50 DIY tassel crafts below. Let’s get started! If this rainbow tassel-adorned basket from A Kailo Chic Life doesn’t make you smile, then we don’t know what will! It’s a fun and easy way to jazz-up your space on a budget too. If you love tassels as much as we do, why not wear one around your neck? Alice and Lois have created this wonderful DIY tassel necklace which is super stylish. Speaking of tassel necklaces, here’s another cool version from A Pair and a Spare. It’s colorful, quirky, and so easy to make yourself! You can even add colorful tassels to your light shades, just as A Subtle Revelry has done. You’ll have to check out the full step-by-step tutorial to make your own! This DIY tassel garland from Bloesem serves as the perfect party backdrop! You can mix and match this design with any colors of your choice. Want to add some extra warmth to your usual bed blanket? Be Purposed had the genius idea of adding thick tassels to hers and we think it looks amazing! You’ve probably seen these gorgeous tassel balloons on Pinterest and fancy wedding websites, but did you know you can create your own? Thankfully, Brit + Co will show you how! A DIY tassel necklace and bracelet? Sounds like a match made in heaven to us! Brit + Co are the geniuses behind this crafty project. 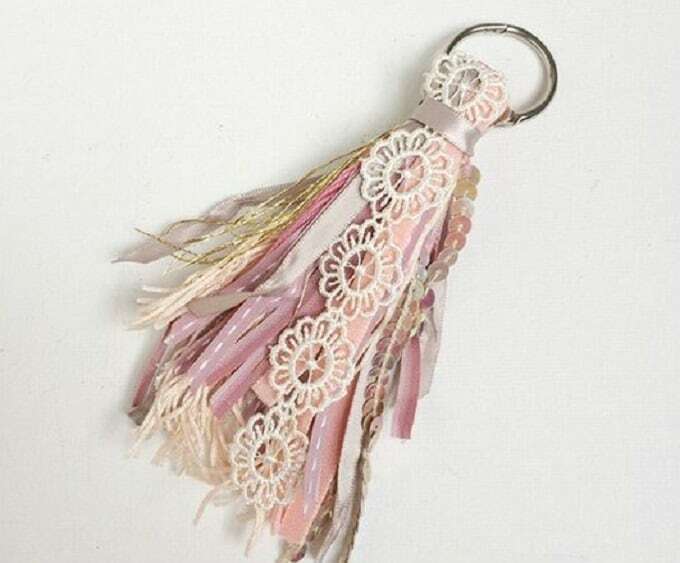 Brooklyn Berry Designs created a DIY tassel with a difference! You can use all sorts of bits and bobs for this design. If you need to add some color and fun to an otherwise plain makeup bag, Damask Love has you covered! She’s created these awesome tassels to add to the zips. How unique are these DIY tassel wall hangings? Dandy and Fine Parties has a great guide to help you recreate these! Adding some tassels to your cushions is a quick and easy way to give them an extra hit of style. Just ask Design Love Fest – she created these gorgeous ones! You can easily add some tassels to a straw clutch bag, just as Design Post Interiors has done. Want to recreate one for yourself? Follow the tutorial for the full instructions! How amazing do these shoes look? The good news is that you can makeover your own pair of heels simply by adding pretty tassels. Check out the tutorial via eHow! This tassel necklace might look like something you’d buy on ‘the High Street’, but you can actually make it yourself – we promise! Enthralling Gumption has this amazing tutorial for you. How cute do tassels look on blankets? Fabrica de Imaginacion certainly thought so too, so she created this DIY version! Isn’t this a unique style of cushion? Fall for DIY created this as an alternative to tassels, but we love how modern the design is! Homey Oh My is a huge fan of DIY tassels, so she created this awesome tutorial to help you make this wall hanging. We love it! We featured some DIY tassel heels just before, so here’s another cool and crafty version from Honestly WTF. So stylish! See, we told you Honestly WTF was obsessed with DIY tassels! Thankfully, she also created these pastel perfection versions to adorn another pair of heels. Amazing! If you’ve got a plain straw basket lying around at home, why not decorate it with some colorful tassels? You can stick to one color scheme as Honestly WTF did, or create a rainbow of colors! Speaking of adorning straw, here’s another tutorial from Honestly WTF featuring some gorgeous bag decorations. They certainly add a nice touch, don’t they? Tassel earrings are very on-trend at the moment, but you don’t have to spend a fortune to snag a pair of your own! Take a leaf out of Honestly WTF’s book and create some for yourself. This is one stunning bag, but to think that it wasn’t actually purchased looking like this! I Spy DIY gave it a tassel makeover and took it to a whole new level. Even the kids can get in on the tassel action! Land of Nod has a child-friendly tutorial for making these funky necklaces. Got a blank wall at home that’s screaming out for attention? Lovely Imperfection filled her empty space with a tassel wall hanging – Divine! Fancy some stylish tassels dangling from your ear lobes? These DIY versions from Made in a Day are sure to turn heads! Beads and tassels – does it get any better than that? Made in a Day has these DIY creations to share with you. Maggie Holmes Design created a notebook using paint chips and decorated it with vibrant tassels – how clever is that? You won’t want to miss this DIY tutorial! Momtastic will show you how you can also make a tassel using baker’s twine – isn’t that great? We love the assortment of colors in this one! Here’s a cute Valentine’s DIY gift that also incorporates tassels. Oh Happy Day is the genius behind this tutorial! Christmas is just around the corner, so why not add some tassels into your festive cheer? Paper & Stitch created these fun DIY animal ornaments for A Subtle Revelry and we think they’re adorable! Have you noticed how popular tissue paper tassel garlands have become online? Forget buying them – simply make your own! Pennies for a Fortune will show you how. Add some tassel magic to your reading time thanks to these DIY tassel bookmarks from Pottery Barn. They’d make great gifts too! Speaking of bookmarks, here’s some more from Projektila! Which ones do you like the most? Did you know that you can also use tassels as a fancy wedding photo booth backdrop? Ruffled Blog certainly did, plus you’ll find the step-by-step instructions to recreate your own! How gorgeous is this tassel necklace? The color scheme is vibrant and fun, plus the gold chain gives it an on-trend look. Check out the full tutorial from Sas and Rose! You can also decorate a cake with tassels, thanks to this amazing DIY project from Something Turquoise! This is a great idea for birthdays, weddings, baby showers – anything your heart desires. Jazz-up some wooden party cutlery with colorful tassels, just as Studio DIY has done! This is one way to bring extra cheer to cake time. Here’s a DIY tassel necklace with a difference! Style Bee will show you everything you need to know to recreate these – and trust us, they’re not as hard as they look. Need a cool way to differentiate between each other’s drinks this festive season? Why not make these DIY tassel drink charms from Sugar and Charm? Tatertots and Jello will show you how to decorate your bed linen with tassels – isn’t that great? Guests will think you’ve paid a small fortune for this! 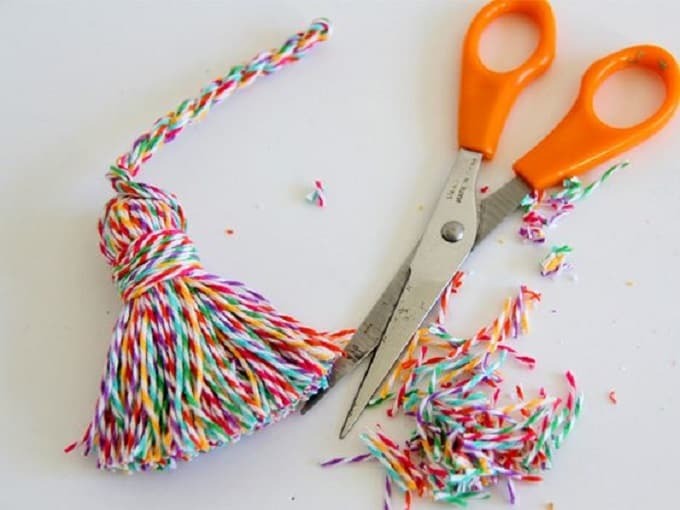 Add some tassels to your party gifts by following this tutorial from Tell, Love and Party! These party bags will win everyone over. We’ve fallen head-over-heels in love with this DIY tassel tote bag from Tell, Love and Party – have you? You could easily create this within just one afternoon too! Picnic blankets are only fun if they have tassels around their edges! Tell, Love and Party thought so too, so she created this DIY version. Wow, take a look at this DIY tassel and gold adornment necklace! The Camelia is the talented blogger behind this instructional guide. Christmas is literally just weeks away, so why not create your own festive tassel garland? Each one resembles a Christmas tree, so the kids are going to love this one from The Party Teacher! Trust Trinkets in Bloom to create some DIY tassel earrings that look like expensive works of art! What’s not to love about these crafty creations? These beaded and tassel-adorned bracelets don’t just look awesome, they’re also very simple to create too! Why Don’t You Make Me will show you how it’s done. Tassels on a stick? Yes please! Woods of Bell Trees made these for decorating the backyard and we think they’re the next must-have party accessory! There you have it – 50 fantastic DIY tassel crafts that are sure to wow you! Which projects were your favorites? We’d love to hear from you in the comments section below!